After several planning and re-planning, finally, my GOA plan is successful! I went there along with my friends and it was a wonderful expedition, I must say. What we heard about Goa beach is lesser than what we discovered ourselves. I was often inspired by Goa travel stories but visiting there is lifetime pleasure. Here I like to share with you all my Goa trip experience, a few days with friends and amidst nature’s delight. We took the Pune-Kolhapur highway… really a very good road to travel.. Then via Amboli ghat, we headed towards Panjim and finally we reached to Dona Paula Beach. There we got a very good accommodation at a cheap rate in one local’s house; we had our lunch and then started sightseeing. A place where two famous rivers of Goa meet the Arabian Sea. There are two legends for the place and so also the name. This place is known as Lovers Paradise due to a myth that Viceroy’s daughter on facing objections to her love affair with a poor fisherman, jumped from the cliff. Another legend says that she was punished for captivating Francisco de Tavora, the Count of Alvor with her charm. Her spirit still haunts every visitor with legends of her love. Then we went towards Mira-mar beach, there we had bhel and finally reached Miramar. Next day we left Dona Paula towards our second destination, i.e.historical churches. A grand church worthy of the power, wealth, and fame of the Portuguese rulers who once dominated the seas from the Atlantic to the Pacific. 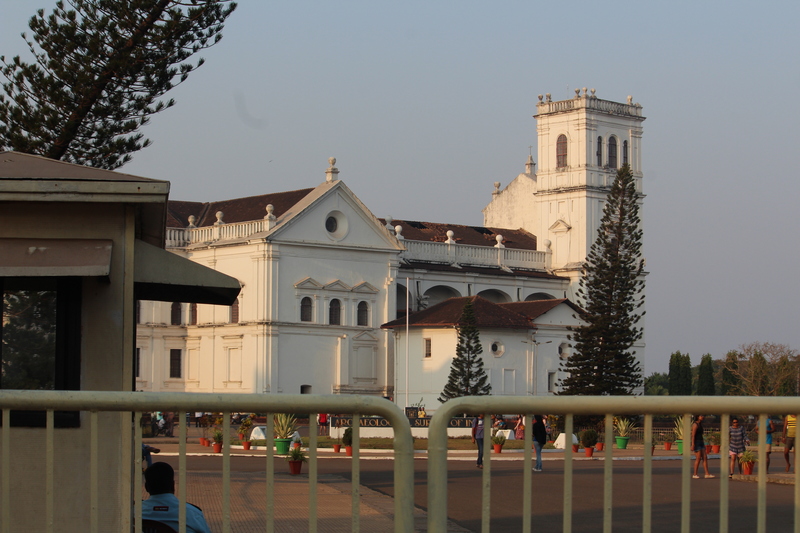 The Basilica of Bom Jesus is the most famous of all the churches in Old Goa and has relics of St.Francis Xavier. It is a beautiful octagonal tabernacle beautifully decorated and has two statues, one of St Francis of Assisi and the other of Jesus on a cross. Vows of humility, poverty, and obedience of St. Francis of Assisi are written right below these two states. Next, we visited famous Mangeshi temple. Covered by forests and surrounded by hillocks, most worshipped Shivalinga was kept here, which is known as Mangeshi. From there we went towards Aguada Fort since it was very dark, we were not able to see the site. Next, we went to Baga beach, spent few hours searching for accommodation finally to find one. We had our dinner at Baga beach; an awesome experience to have dinner at the seashore and went back to our rooms to rest as we were very tired by our daytime expedition. Next day we took to swimming in the sea, ride on a water scooter, fly with para sailing, amazing bumper ride and lots of fun on a banana ride and all these in just 500/head. We had delicious and expensive fish for lunch and headed towards Aguada Fort and Chapora Forts. The Fort got its name from the Portuguese word, ‘Aguada’, which means water. It is a hotspot of many natural springs; a part of this famous fort got changed into a central jail. The fort is built of red laterite, as a watch post at the border. Then we went to Anjuna beach which is made up of rocks and next it was Vagator beach.It is a huge and mostly empty, calm beach. For shopping, we went to Calangute beach… where I spent 3 hrs for shopping, bargaining with the sellers, little complicated but at last it was worth doing so. We have cheapest but delicious dinner of the trip followed by varied discussions while sitting on the beach sands. Welcoming back to Baga suddenly we had cravings for ice cream and after searching for an hour, finally we found an ice cream parlor and that too around a pub. The last day we right away started our journey back to home. A friendly and chic resort on Goa’s finest beach. Little Palm Grove, a sister resort a few distance away, is for private affairs compared to Palm Grove’s family-friendly ambiance but both are gorgeous. This private property is split among beach rooms and 2-storey hill bungalows both are luxurious and give a southeast Asian feel, designs and decors are exceptional. And the breakfasts are exquisite. The offers some of finest customer service in the country, so you’ll be well cared while your stay in its luxurious Rajasthani tents (a few air-conditioned). The restaurant there serves an awesome breakfast, and fine cocktails as well. This is located in Agonda Beach. You can select between beachside rooms, village-side rooms and beach huts that retains the old Goa prices while providing good service, nice coffee, and decent food in a charming way. Besides the above, you can also try some cheap hotels in Goa like Baywatch Express Urbane, SinQ Edge (Panjim), The Ocean Park Resort, Apple House (Bagga ). To mention, the divide between north and south of Goa is essential for holidaymakers to try and experience both the sides. The south is great to laze by the pools or on the sand while soaking in the sunshine and the north offers diverse dining and nightlife scenes, and its crowded markets. Whether you are a beach person, a history buff or a foodie, Goa has lots to offer in every manner to holidaymakers. From the stunning shores beaches to striking lush greenery of its countryside, Goa is splendid with mesmerizing colonial history and mouth-watering food. Goa is certainly a destination to be in one’s travel bucket list. Stay connected with us and keep visiting on FourmMantra – A Place Where You Ask! You Answer!